It had to happen sooner or later. After April Yahoos marked 'the seventh straight month of chess in the mainstream press', the streak ended in May. The only oblique reference to chess was a Kasparov vs. Putin story. While Garry is always as entertaining as he is outspoken, this is a chess blog, not a blog for Russian politics. A few years I devoted a full post to the subject in Geopolitical Yahoos (October 2014), and I could have featured similar stories at the end of last year in November Yahoos and December Yahoos. So I ended up anyway with another Kasparov story, this one on his third favorite subject after chess and Putin. What will the not-so-genial GM say once he realizes that AI was the enabling technology that gave Putin the power 'to meddle in American elections'? Here are three more stories that would have made good Yahoos. All of them highlight secondary aspects of chess. The story I would have most liked to see featured in Yahoo was the outcome of the U.S. Championship. Here's the version by Leonard Barden. May Yahoos continue in June. If not, we'll have more Google News. The [CJA's] revamped site has 'News', mainly minutes from past CJA annual meetings, an 'Awards Archive' with links to relevant material, and back issues of The Chess Journalist, which hasn't been published since 2014. Since then I've been downloading old copies of The Chess Journalist (TCJ), wondering what chess news/wisdom could be gleaned from the publication. In preparation for a recent weekend trip, I copied seven years of TCJ (2000-2006; 28 issues) to my Kindle, then spent an hour each morning flipping through them. The Kindle is my favorite tool for reviewing digital documents. Whenever I find a page worth further research, I can take a snapshot as a reminder that there was something interesting on the page. This is how I prepared the material for Early U.S. Ratings : A Summary and an Exercise (October 2017), which was another vacation project based on digital copies of Chess Life from the 1950s. One of the TCJ pages I noted is shown below. It was the cover for the September 2001 issue and re-uses a well known illustration from the 19th century. 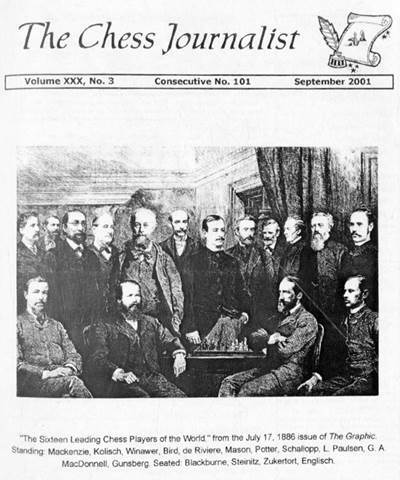 "The Sixteen Leading Chess Players of the World" from the July 17, 1886 issue of The Graphic.  Standing: Mackenzie, Kolisch, Winawer, Bird, de Riviere, Mason, Potter, Schallopp, L.Paulsen, G.A.MacDonnell, Gunsberg.  Seated: Blackburne, Steinitz, Zukertort, Englisch. I'm the type of person who counts everything. If I'm culling a collection of 32 items and end up with 30 items, I'd better find two items in the deleted tray. If not, I spend time to locate the source of the error. In the case of this TCJ cover I couldn't help but notice that of the 16 'leading players' shown in the illustration, only 15 were named. Who was missing? I found three copies of the image in my archive. The best copy showed that the 1886 original had the names and nationalities of the players listed outside the border of the image. The best associated text copied that information. Unfortunately, the names in that text didn't correspond exactly to the TCJ list. This turned out to be because two of the players in the top row were identified in the list of names for the bottom row. J.H. Blackburne (England), W. Steinitz (U.S.), J.H. Xukertort [sic?!] (England), B. Englisch (Austria-Hungary), Captain George MacKenzie (U.S.), Baron J. de Kolisch (Austria-Hungary), S. Winawer (Germany), H. E. Bird (England), M. de Riviere (France), S Rosenthal (France), James Mason (U.S.), W. Norwood Potter (England), Emil Schallopp (Austria-Hungary), Louis Paulsen (Germany), and Rev G. A. MacDonnell (England), Isidor Gunsberg (England). With the help of this list I located more copies of the illustration on the Web. The best is at Chess Pictures (chessbookchats.blogspot.com; June 2017), where the image is tinted and expands to a large size where the face of each player can be seen clearly. I'm no expert on photoshopped images, but the original illustration from The Graphic appears to have been made through some sort of copy/paste process combining different sources. Later: Re that last comment -- 'I'm no expert on photoshopped images...' -- a note under The Graphic's original caption ('Leading Chess Players') says, 'A Portrait Group'. When I first saw this on a zoomed copy of the illustration, I thought I was reading it wrong because the letters are severely blurred on my copy; the legend 'A Group Portrait' would make more sense. Afterwards I realized that 'A Portrait Group' describes the creative process: made from a group of portraits. Here's a screen capture showing the end of the first game and the start of the second. I don't know what 'Version 10' and 'Engine 10' mean, so I'll come back to that another day. All users on the list show the same values for those fields. It goes without saying that the game has absolutely nothing to do with my own play. It just happens to have been played on a machine that belongs to me. As I scrolled through the moves, it looked like any other game until I came to this position. White looks better here. The White Pawns present a better structure and White owns the open a-file. There are still plenty of moves to be played, but White should do no worse than draw. Suddenly Black played 34...Qf4, placing the Queen en prise to two pieces. Give that move '??'. I don't understand what happened here and will look into it another time. Chess.com has acquired the powerful computer chess engine Komodo, the company announced today. The acquisition of the Komodo comes with the release of an exciting new version of the engine called Komodo Monte Carlo, where moves are chosen by win probability and not traditional evaluation. The approach is similar to the probabilistic methods of the machine-learning chess projects AlphaZero and LeelaChess, which have fascinated chess players with their intuitive styles and fantastic success. Along with the software and brand, the entire Komodo team has agreed to join Chess.com. GM Larry Kaufman and his Komodo team will work with Chess.com developers to build the most insightful, powerful, and deepest-analyzing chess engine possible. It's not clear how this will change the chess engine landscape, but Chess.com never does things lightly. Another post on The Sociology of Chess (November 2016), another video from the Saint Louis Chess Club. The previous video, 2018 U.S. Championship - Hall of Fame (April 2018), was the second in a row, making this one the third. Grandmaster Maurice Ashley talks to Dr. Jeanne Sinquefield, co-founder of the Saint Louis Chess Club, during Round 10 of the 2018 U.S. Chess Championships. Half of the Sinquefield show is Dr. Jeannie Sinquefield and we would say the better half, too. Rex is crazy. She's the reasonable one in the family. You need the dreamers and you need the practical ones. Dr. Jeanne Cairns Sinquefield received a Masters in Business Administration and a doctorate in demography from The University of Chicago. A doctorate in demography -- I bet that not many of those have been awarded. ...plus this long-running series on sociology will now continue once a month each, rotating on Sundays. This month the chess world lost another former Soviet star, Evgeni Vasiukov (1933-2018). I searched my archive of eBay material and found only a single item featuring him. It's still worth a post. Original Soviet chess press panoramic photo. 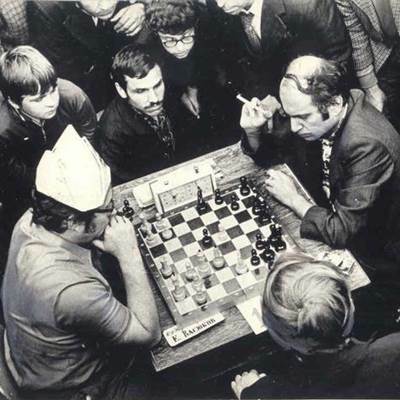 Grandmaster Evgeni Vasiukov plays white against Grandmaster Mikhail Tal, 1970s. Retouched for publishing in Latvian chess magazine "Sahs". For the past few weeks I've been running a series to learn more about Fabiano Caruana's early career. Here is a summary of the posts. Although I didn't plan it at the time, the four posts document a natural progression in the early career of any budding chess superstar: early steps, Grandmaster title, GM supertournaments, World Championship aspirations. If I had been more alert while putting together 'early steps', I would have included Caruana's experience in youth tournaments. I might come back to Caruana's career for the 2018 Carlsen - Caruana title match later this year in London. In the meantime, here are a number of related posts on this blog -- most of them recent -- about GM Caruana. Posts marked '(*)' are currently showing up in 'Popular Posts (Last 12 months)' at the bottom of all blog pages. This attests to Caruana's popularity. For more info, go to lczero.org and refer to the links in the left navigation bar. ...I clicked through 'Getting Started' and eventually got to a page of the same name: Getting Started. First question: On which machine should I install the Leela software? I decided to install it on my WIN7 PC. That's where I do most of my writing. Since the objective of the exercise is to write a few posts about Leela, it would be easier to copy/paste material directly into a post, like this one. Unfortunately, I ran into a technical problem and after fiddling a bit decided that WIN7 was the problem. I switched to a WIN10 PC. I followed the instructions again (the second time went faster) and this time everything worked smoothly. After downloading and unzipping the file, I launched the client, set up a new account, and the software started automatically. Here's a screen capture showing the end of the first game and the start of the second. There are so many angles to today's featured photo that I hardly know where to start. A game of chess © Flickr user Luke McKernan under Creative Commons. Barbara Kruger chess set, with paintings by Paula Rego, Peter Blake and Edward Hopper. The Waste Land exhibition, Turner Contemporary, Margate. Margate: Ernst Gruenfeld won at Margate 1923 ahead of Alekhine (and others), although the tournament is not mentioned on BritBase: 1920-29 (saund.co.uk). For the next decade, BritBase: 1930-39, the site gives as Margate winners: 1935 Reshevsky, 1936 Capablanca, 1937 Fine/Keres, 1938 Alekhine, 1939 Keres. I presume the annual series ended because of WWII (1939-1945). 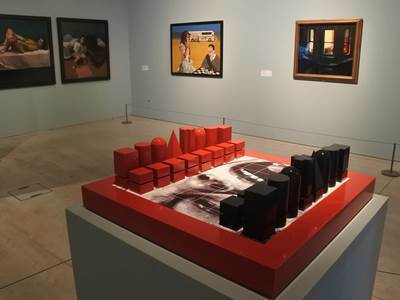 Barbara Kruger chess set: The Margate photo is taken at an angle that captures both the chess set and an artwork featuring chess behind the set. It's not immediately obvious, because the chess set is shown from the wrong side, but the board is a photo of a boy screaming. A better view of the boy's head is at The Art Of Chess 2006 (tatintsian.com; 1/10, all sets). The chess artwork by Peter Blake shows Marcel Duchamp. Another work featuring Blake recreates the famous photo of Duchamp and model Eve Babitz. Flickr: This current post is the follow-up to The Last Flickr Friday, where I said, 'I'll be cutting the series back to one post a month and moving it to Sunday.' It might also be the last Flickr photo: SmugMug acquires Flickr (techcrunch.com; April 2018); the article overviews the history of Flickr, 'founded in 2004 and sold to Yahoo a year later'. I hope the situation after the acquisition will continue to provide inspiration for future posts featuring chess photos. While I'm not planning to stop anytime soon, I will start to slow down; maybe go from one post per day (across my four blogs) to 5-6 posts per week. So here we are, another Friday and I have nothing special to do. Before signing off completely, I'm going to spend a few Fridays looking at the impact of artificial intelligence and neural networks on the world of chess. To get started, I gathered all previous posts on the subject(s) into a new category: Showing posts with label AI/NN. It's a technology that is not only transforming chess, it's transforming nearly everything that we do. What's the value of the first move in chess? Most people would say it's a tempo, but there's a problem here. ... where 'X' is the value of the first move for White, '-1' is the value of the lost move, and '-X' is the value of the new situation for Black. Solving for 'X' gives X = 1/2. This means that the value of the first move is not a tempo; it's a half-tempo. QED? ...where a Pawn is worth 1.0. Kaufman's observation confirms the X = 1/2 calculation. Why bring this up again? While reading the September 2017 issue of Chess Life, I noticed that GM Lev Alburt gave the following diagram in his monthly column, 'Back to Basics', after the moves 1.c4 e5 2.Nc3. Most people would accept that statement as obvious and continue with the column. We've all seen similar statements many times and accepted them without question, but it might not be so straightforward. According to Kaufman's work, White's advantage might be *only* a half-tempo. I plugged the position after 1.e4 c5 into an engine, looked at the analysis, entered a null move for White, and looked again at the analysis. The difference between the two analyses (before and after the null move) was not a half-tempo, it was closer to a full tempo. Why is the value of a move a half-tempo at the start of a game and a full tempo later? I think it's the difference between 'having the move' and 'making a move'. Once you make a move the advantage of having the move passes to your opponent. I'm a big fan of chess960. I've always assumed that different start positions have different values. According to the analysis above (X - 1 = -X), every position starts with the same fundamentals -- a tempo is a tempo no matter what the start position might be. So why do some chess960 start positions seem to offer a better opportunity for White to gain an advantage? Maybe it's for the same reason that some moves in the traditional start position (as in the diagram above) offer a better opportunity than other moves. After all, 1.d4 and 1.e4 are better moves than 1.a3 and 1.h3. A move that accomplishes two objectives is better than a move that accomplishes a single objective; similarly, a move that does nothing is better than a move that makes the position worse. Just don't say, 'Pass!'. Between the 2009 and 2010 Corus tournaments, there was another significant event: the 2009 World Cup. According to my World Championship Index of players [A-G], GM Caruana has played in five World Cups. Following is a summary of his results in the seven-round knockout events. 2009 World Cup; Khanty-Mansiysk, Russia, XI-XII, 2009. 2011 World Cup; Khanty-Mansiysk, Russia, VIII-IX, 2011. 2013 World Cup; Tromso (Norway), VIII-IX, 2013. 2015 World Cup; Baku (Azerbaijan), IX-X, 2015. 2017 World Cup; Tbilisi (Georgia), IX, 2017. How did he qualify for the World Cup events? Another of my pages, World Chess Championship Zonals, includes links to 'Qualifying Paths' for each cycle. As the official challenger in the forthcoming 2018 Carlsen - Caruana title match, GM Caruana is guaranteed a place in the following cycle. Whatever the outcome of that match, I expect he will be a key participant in World Championship cycles for many years to come. After last week's introduction to Leela Chess Zero and the TCEC, where to go next? How about an explanatory video? In last year's introduction to AlphaZero, A New Style of Chess (December 2017), I featured Agadmator's Chess Channel on Youtube, so let's call on Agadmator again. Great progress has been made so far -- Leela has gone from random play to around 1800 now on average hardware in four weeks. The catch is that project relies on people running Leela on their computers so there are more matches for Leela to learn from. A couple of months ago on Video Friday we had Magnus Streams on Youtube (March 2018). Now we have World Champion Carlsen's next challenger hosting a stream; see 2018 Carlsen - Caruana; London for more about next November's title match, including the official site, etc. World championship challenger Fabiano Caruana decides to put his skills on display by playing AND streaming the May edition of the Titled Tuesday blitz chess tournament. Joining him is Anish Giri who's hungry to defeat him "on air." For Chess.com's written report on the event, see Petrosian Wins Titled Tuesday Ahead Of Giri, Caruana. In the future I'll be featuring videos once a month on this blog. The previous, fortnightly schedule ended a few days ago with The Last Video Friday. By some happy quirk of fate/metaphysics, that first Video Friday post has survived intact. I don't know what the odds are of a video becoming unavailable, but based on the number witnessed via this blog, it must be fairly high. I'll still continue reviewing recent YouTube submissions on the subject of chess, but it won't be on Friday. ...and this year I expect we'll have similar. The following table shows a side-by-side comparison of the award categories for last year and for this year. Too small to read? The CJA's completely revamped web site, Chess Journalism (chessjournalism.org), points to an online entry form that includes the same list of categories. What's changed? The first four category groups for 2018 ('THE TOP FOUR', etc.) are carbon copies of the 2017 groups. When we reach 'NEWS AND FEATURES', things start to change. The category 'Best Tournament Report', which was present in 2016 but missing in 2017 (apparently an oversight), is back in 2018, and split into two: 'National / International' and 'Local / Regional'. The other categories in the group are unchanged except for a new category, 'Special Achievement'. Whether you're a CJA member or not (I'm not), the CJA's revamped web site is worth a visit. It appears to have changed end-2017, but if you're nostalgic for the old site, it is still available at archive.org / chessjournalism.org. 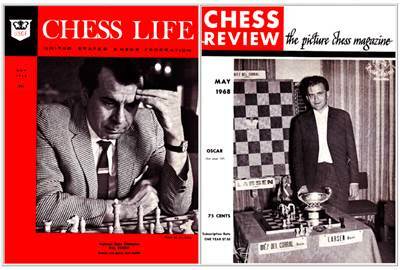 PDFs of old issues of The Chess Journalists have begun to be put up online. There is also a list of issues that are missing from the White Collection in Cleveland that has been placed on line. The earliest issue currently available is 'Chess Journalist - Spring 1977 v5 n1'. Since I've never seen an issue of the periodical dated before 2007, there is plenty here to keep me busy until the 2018 CJA Awards are announced three months from now. The GM title helped Caruana gain invitations to the next level of tournaments. In January 2008, he would play in Wijk aan Zee (Corus 'C') for the first time. The following composite image shows GM Caruana's performance at Wijk aan Zee in 2008, 2009, and 2010. He won the C-event easily in 2008, won the B-event with considerable luck in 2009, and finished +1-3=9 at the A-event in 2010, three points behind winner Magnus Carlsen. Now that I've finished with TCEC Season 11 (see last week's Battering the French for the final post), where should I go next? The first post in this current series on engines, Back to the Future with Chess Engines (April 2018), promised a look at the future. What could be more futuristic than AI? In the middle of last month, the TCEC organizers announced Leela Chess Zero enters TCEC Season 12 (chessdom.com). Leela Chess Zero (LC0), an open source adaptation of DeepMind’s recent Alpha Zero artificial intelligence demonstration project, will compete in TCEC’s Season 12. In so doing it will become the first chess-playing neural net in history to publicly challenge traditional human chess programming. Leela was placed into the lowest of the TCEC qualifying events, Division 4. Based on its poor performance, it might be at risk of being dropped for future TCEC seasons. Here's a crosstable of the event. Ouch! I better not waste any time. For the next few weeks in this series I'll look at Leela and its technology. Here on Top eBay Chess Items by Price (March 2010), we've had A Six-Figure Chess Item at Auction (November 2017; 'Marcel Duchamp : Pocket Chess Set'), and A Seven-Figure Chess Item at Auction (also November 2017; 'The Chess Players' by William Roberts). A five-figure item might seem commmonplace, but there were only three others listed in the 'Six-Figure' post. 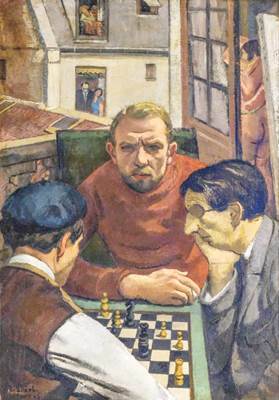 The item pictured below was titled 'Frantisek Zdenek Eberl, French/Czech (1887-1962), Chess Players, oil', and subtitled 'Part of a live auction event on Thursday, Apr 26'. The winning bid was US $38,000 after 20 bids. Seller's Estimate: USD 6,000 - 8,000. Oil on canvas, signed "F.Z. Eberl" and dated "Paris 25" lower left. Inscribed "Salon d'Automne" and "d'Office" on the reverse. 41 x 28 1/2 inches. Provenance: Ancienne Maison P. Ferret, L. Helvig, Successeur, Paris, France; Private Collection, New Jersey. Exhibitions: Salon d'Automne (1925), Paris, France. François Zdenek Eberl (1887-1962) was a Czech-born painter who worked mainly in Paris, France. At his prime, his name was included among those of fellow painters and personal friends Pablo Picasso, Amedeo Modigliani and Maurice de Vlaminck. [...] Drawing inspiration from the folklore of Paris, his preference was to paint the street scenes and nightclubs as he observed them. How does that fit into Chess and Art Movements (December 2017)? Other than a few tags -- Tallinn, Estonia, Sculpture -- and a link to Wikipedia's page on Paul Keres, this photo had no information about the setting. 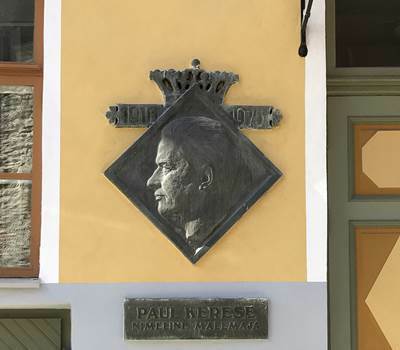 It appears to be an exterior wall plaque, perhaps on the house where Keres lived. Paul Kerese © Flickr user Alan under Creative Commons. Given 'Nimeline Malamaje', Google Translate says it's Estonian and turns it into 'Nickname Malamaje'. That information leads nowhere, so we are free to use our imagination. I might try to find another source of photo sharing. Like other Yahoo services that I use from time to time, Flickr seems to be failing gradually. I'll be cutting the series back to one post a month -- it's been every two weeks since the first post: Flickr Friday (August 2008) -- and moving it to Sunday. Last month's 'On the Cover', April 1968, featured a correspondence chess champion and a chess set. This month the series returns to the same two world class crossboard players who appeared in the November 1967 'On the Cover'. At Lake Tahoe, Nevada, from March 24 to 29, 111 competitors took part in the National Open Tournament. When it was all over, International Grandmaster Pal Benko had the first prize of $1250 in his pocket. The tournament director and principle organizer, Ken Jones of Reno, is a lover of chess and philosophy. He has decided not to direct next year's event, a decision no doubt prompted by several misunderstandings and ensuing disputes during the tournament. It fell to Bent Larsen of Denmark to win the first "Chess Oscar" this year at the tournament at Palma de Majorca. Larsen and the trophy therefore appear on our front cover this month, and the first part of Dr. Petar Trifunovich's account of Palma de Majorca carries the story in some detail. Does Larsen, who happened to win when and where the tournament organizers dreamed up the scheme of nominating and electing the "Player of the Year," merit that award? Petar gives some ponderable cons to rate against the Dane's four straight victories. First "Chess Oscar"  As Palma was the last chess event for 1967, the organizers hit upon the great idea of proclaiming "the best chessplayer of the year." Along with the proclamation goes a "Chess Oscar" after the long established custom of filmdom. For chess, this is a (more modest) silver cup. This idea introduces a bit of change and enlivening into the humdrum routine of chess life. For this purpose, a jury was constituted of chess journalists accredited by the tournament: Puig Laborda and Eduardo de Perez of Spain; Harry de Graaf of Holland; Silvain Zinser of France; and Deimitry Bjelica of Yugoslavia. They voted for Bent Larsen of Denmark as the best player in 1967 on the strength of his first-place victories in the Capablanca Memorial at Havana, the Winnipeg International (a tie with Klaus Darga of West Germany), the Interzonal at Sousse and the International Tournament at Palma de Mallorca. The decision of course has no official significance -- rates perhaps somewhat less than the "grandmasterships" conferred by the Czar of Russia at St. Petersburg in 1914 -- for it was brought about without the collaboration or agreement of the FIDE. It is a one-sided declaration of the journalists who happened to collect at one tournament. And, in fact, one notable chess reporter present, Grandmaster Kotov, did not support the declaration. Indeed, the objectivity of this decision may be questioned. The Chess Oscar may, first, be unduly apt to be awarded to the winner of the concurrent tournament. Second, the jury gave no explanation as to why Robert J. Fischer, for instance, surely a possible rival, was excluded. Surely, all aspirants and all results ought to be taken into consideration, both the positive and the negative. Here is a brief resume, which this commentator offers as possibly incomplete, speaking without full documentation. Larsen shared third and fourth with Yefim Geller at Monaco; and, what is quite important, he was not only outscored but also beaten by Fischer. At Dundee in Ireland, Larsen split second and third with Fredrik Olafsson of Iceland, and behind Svetozar Gligorich of Yugoslavia. At Winnipeg, Larsen shared first with Darga. True, Larsen's great victories at Havana, Sousse and Palma are clean as a raindrop. But Fischer had first places exclusively: at Skopje and Monaco, he had no consort; and, even when dismissed from the Interzonal at Sousse, he led undefeated. At the least, a decision between these two chess giants does not come easily. But the jury left us with no explanation. And what would have happened if the jury had designated someone else, someone not among the participants at Palma? "Oscar" certainly could not have been handed over! That excerpt is perhaps too long-winded for this blog post, but it *was* the first 'Chess Oscar'. Eleven years later I'm still wondering how to stop. While I'm not planning to stop anytime soon, I will start to slow down; maybe go from one post per day (across my four blogs) to 5-6 posts per week. Past experience says that this won't last long. I always manage to fill the newfound free time with chess or with blogging. I'm drawn to the two activities like a moth to a flame.